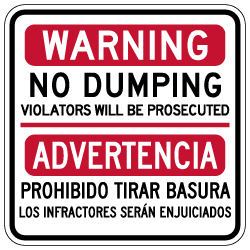 English: Warning No Dumping Violators Will Be Prosecuted. Spanish: Advertencia Prohibido tirar basura los infractores seran enjuiciados. Reflective Rust-Free Heavy Gauge Aluminum Property Signs with Anti-weather and Anti-graffiti protection Available.